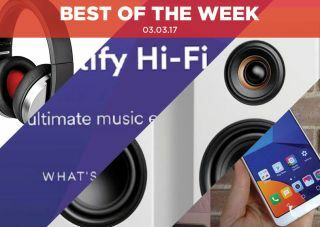 Best of the Week: Spotify Hi-Fi, Focal Listen headphone, Denon and Marantz sale | What Hi-Fi? This week it emerged that Spotify could be teasing a new lossless streaming option, Huawei is releasing two hi-res audio compatible phones and Denon and Marantz has been bought by a US venture capitalist firm. Elsewhere we have reviews of Focal's affordable Listen headphones, Triangle's Elara LN01A standmounter and Jabra's inexpensive Move Wireless headphones. Some Spotify users in the US have noticed they could access Spotify Hi-Fi, a new lossless music service from the streaming giant. The quoted price is an extra $7.50 on top of $10 already paid, which is lower than Qobuz or Tidal's pricing. Spotify responded by saying it had "no news to share at this time". Huawei has announced two new smartphones, both of which will come with hi-res audio compatibility. The P10 and P10 Plus have support for 24-bit/192kHz audio, which should be a bonus for music aficionados. The handsets are expected to go on sale in the UK in April. D+M, previously known as Denon and Marantz, has been sold to a US private equity firm. The new owner is Sound United, which also counts Definitive Technology and Polk Audio as part of its portfolio. Early talk about the future of both brands has leaned towards expanding product lines, so could we expect some new products shortly? Wheel by Miniot - the most minimalist turntable ever? "If you’re looking for a pair of on-the-go over-ear headphones, the Focal Listens are a smart choice"
Focal has a good reputation for delivering quality products and these headphones do not let the side down. The Listens boast an organised and spacious soundfield that's rich in bass and smooth on the treble, making for a comfortable listen. The lack a certain amount of clarity and enthusiasm, but for a portable pair of on-ears, they're a smart choice. "…satisfy anyone looking for a convenient, space-saving system solution that plays ball with almost any source"
Triangle is back with a powered speaker effort and it's a satisfying option for anyone looking for a convenient hi-fi solution. The Elaras are versatile speakers that work well with most sources. The sound is sturdy, lively and upfront, though bass can be overstated and it's not the most precise or subtle either. Despite that, they're a fine option if you're looking to save space. "However, if you’re on a tight budget, these are a good buy"
If you're on a tight budget, these Jabras are a good option. Reasonably comfortable with a stable wireless connection, they have a balanced sound that handles both treble and detail well. At this price you'll be pleasantly surprised by the performance they offer.